In case you don't live in the Midwest (or really, it sounds like the East Coast and the South aren't doing too great either!) it has been absolutely freezing lately. Yay, January! So since there's currently a tiny baby growing in my body who I'm trying to keep safe, I made an executive decision this week to stick with indoor pictures. The hallway in our bedroom may not be the prettiest location, but hey, turns out it gets pretty good lighting! 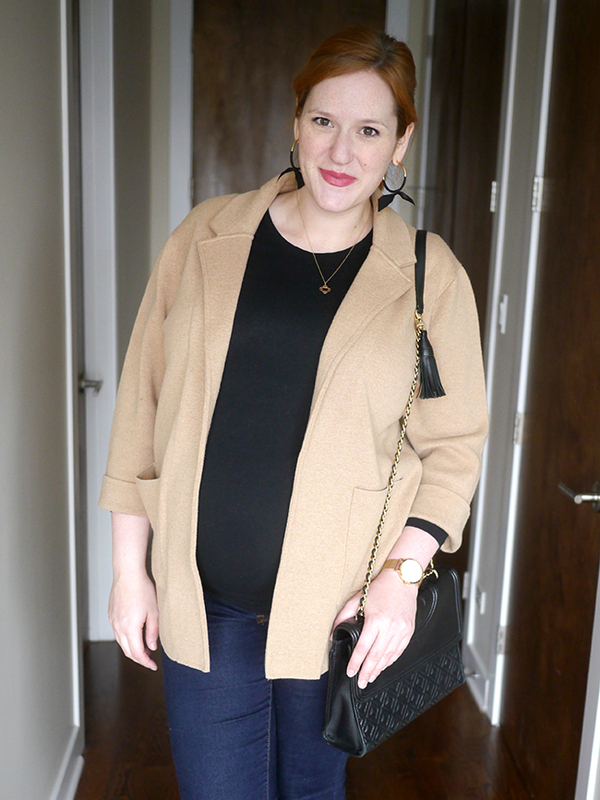 I threw this on last week to run to a daycare tour (that, it turns out, was basically cancelled without anyone telling me - yay!) and realized it's made up a few of my favorite things as of late! I'd heard people raving about this sweater blazer for probably over a year but never quite pulled the trigger myself. I mean, after all, I owned this remarkably similar one so I couldn't quite justify it. But this baby stayed on my wishlist and my sweet mom ended up buying it for me for Christmas! Thanks mama!! The fit on this is definitely oversized, but in a good way. I still got my normal J.Crew size (XL) and didn't think I needed to size down. 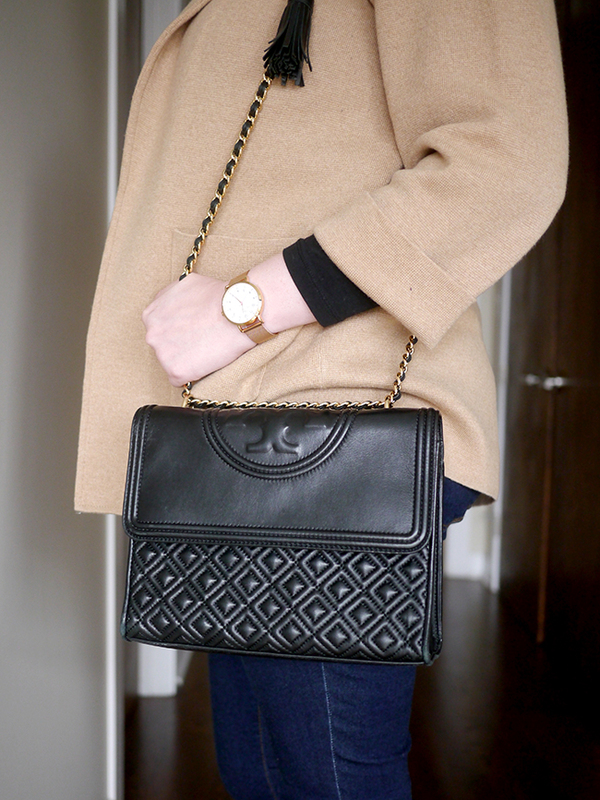 I love the rich camel color since it seems to go with everything, and the fabric weight is heavy and warm without being itchy. I also like that the lapels stay folded down without having to adjust them, which makes this feel more blazer-y and work appropriate. It does have bracelet length sleeves which I find slightly awkward on me, but I just give them a quick roll which makes them fine. I was really slow to jump on the sock bootie trend, but man am I glad I finally tried it! I've ordered countless pairs of booties but always end up returning them because I can't stand the way they rub on my ankles. Really, my TOMs booties I wear all the time are the only ones I've tried with a low enough profile to not rub. But sock booties? I mean, the top is sock material, so there's absolutely no rubbing! 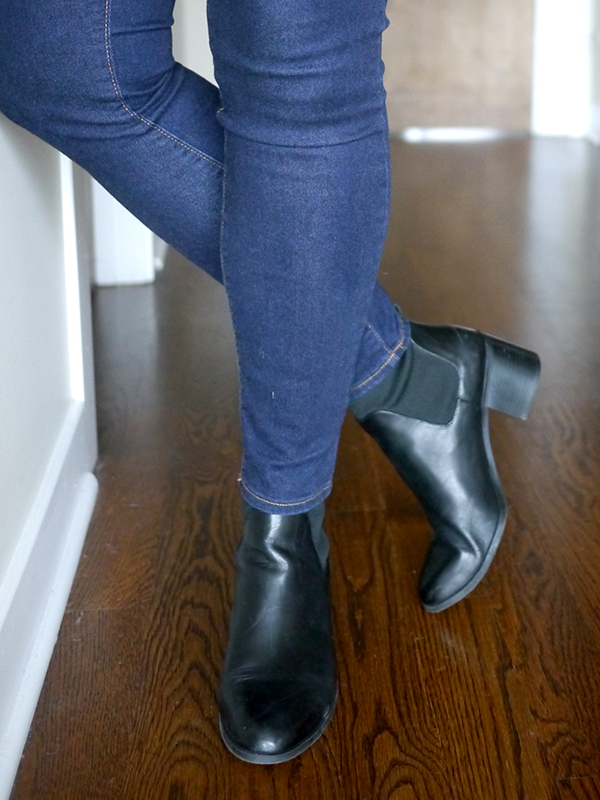 They're also great for Chicago winters because this style of bootie isn't meant for you to roll the cuffs of your jeans with or show a little ankle. I can wear thick socks underneath and no one will ever know! This particular pair also has a low heel that's really comfortable for walking everywhere. I've taken them for a few longer walks (a mile or two) and haven't had any problems, even the first time I wore them! Definitely some keepers over here. Okay, so these were initially not favorites of mine. I basically bought them when my bump was smaller, and I could not get them to stay up for the life of me. But suddenly this month, now that the bump has reached almost max capacity, they're staying up on me just fine. I particularly love this style because the fabric for the belly panel is sewn in about an inch below the waistband of the jeans and there's a real waistband with a button fly, so you can still do a front tuck if you want to! You know, for fashion and whatnot. 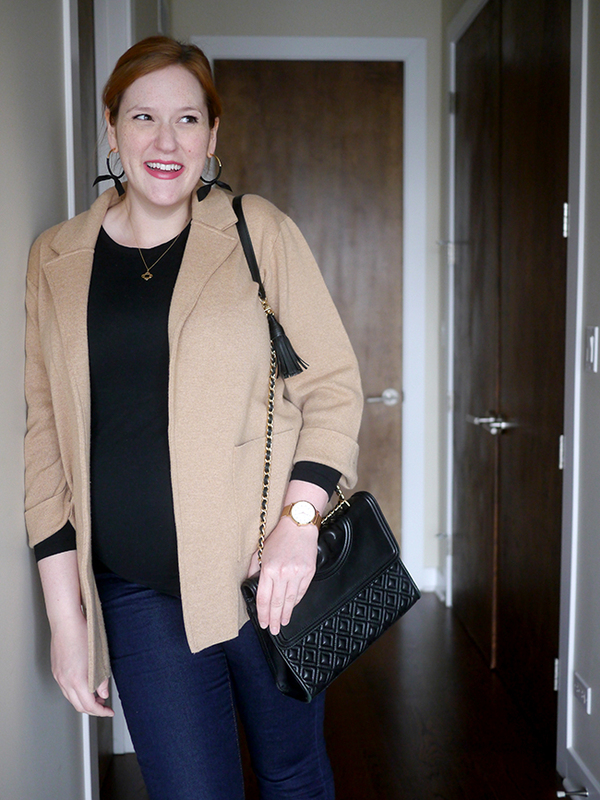 Also, the real reason these jeans are winners for me is that they actually come in a long length! 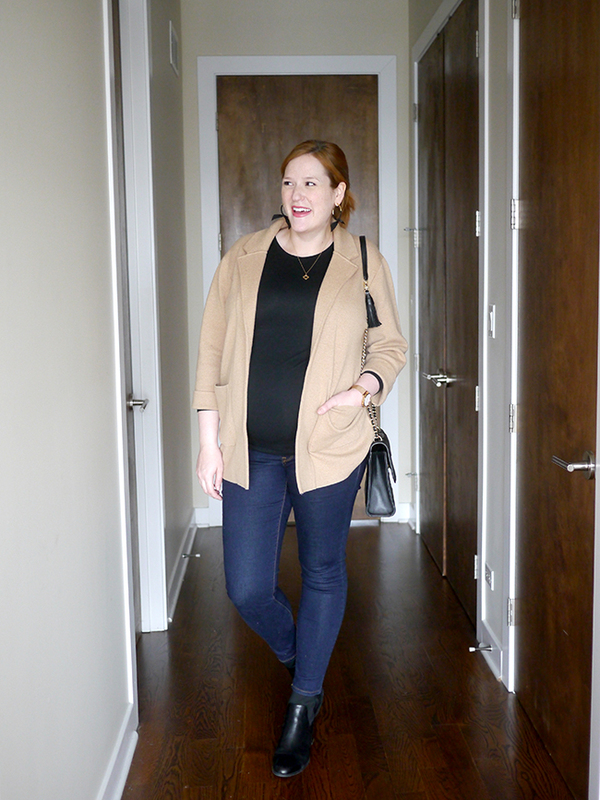 You would not believe how hard that is to find - shopping for maternity jeans brought back all of my high school jean shopping anxiety! 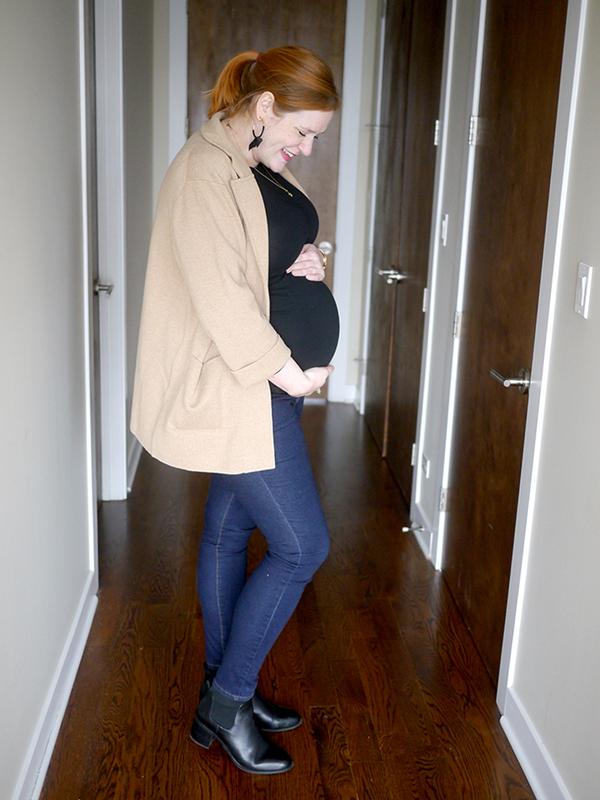 For this pair of maternity jeans, definitely buy your pre-maternity size (or maybe even size down!) since they're really stretchy. I think if I had sized down I would have been able to wear them earlier in my pregnancy.